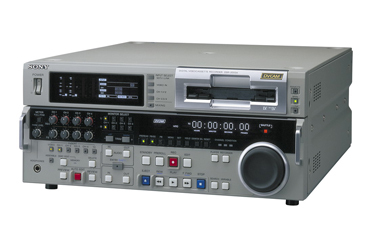 DVCAM Master Series Digital Videocassette Editing Recorder. The DSR-2000A offers the addition of an integrated i.LINK IEEE-1394 digital interface. This upgrade will extend i.LINK connectivity of Sony DVCAM storage solutions, providing professional video producers who use the DSR series compatibility with more DV I/O equipped cameras, VTRs and non-linear editing systems. i.LINK interface included as standard signal input/ouput i.LINK interface includes audio unlock/lock function. When an unlocked audio signal in a DV recording (10 micron) is input via the i.LINK connector, this new A version Master Series VTR will automatically transform it to a locked audio signal which is defined as the standard of the DVCAM format for frame-accurate editing. The DVCAM Digital Component Recording Format The DVCAM format is the professional extension of the consumer DV format. The DSR-2000A employs the DVCAM format which uses 8-bit digital component recording with 5:1 compression ratio and sampling at the rate of 4:1:1 to provide high picture quality and multi-generation performance.. In addition to its high picture quality, the DVCAM videocassette tapes are available in two sizes: mini and standard. With the standard size cassette, up to three hours of recording is possible. Playback Compatibility with All DV (25 Mbps) Format The DSR2000A is designed to support all DV (25Mbps) format recorded tapes, including DV tapes recorded in LP mode and DVCPRO tapes without an adapter. Pre-Read Editing Capability Thanks to newly developed digital processing, the DSR2000A incorporates a preread editing capability never before offered in a 6.35 mm (1/4 inch) VTR. This feature allows the editor to execute a picture transition with effects between two VTRs as well as audio mixing/audio channel swapping with frame accuracy. Moreover, when performing over dubbing of audio, the usual delay experienced at an editing point is eliminated. DMC (Dynamic Motion Control) Equipped with Sony's Dynamic Motion Control Editor function, the DSR-2000A provides noiseless slow-motion playback within the range of -1 to +1 times normal speed. Functionally Designed Operating Panel Incorporating a front panel with a built-in Jog/Shuttle dial allows two-machine editing. Excellent Editing Performance Quick, mechanical response time is an essential requirement for professional editing. To achieve this, the DSR-2000A uses a direct reel and drum monitor mechanism. The DSR-2000A has the industry standard RS-422A Sony 9-pin remote control interface. This allows it to be easily integrated into conventional editing suites, thus creating a user-friendly, professional editing environment. Versatile Interfaces All conventional analog interfaces for video, audio and time code are supported by the DSR-2000A. In addition, it has digital interfaces such as the SDI, SDTI(QSDI), AES/EBU, i.LINK (DV In/Out), and SDTI (MPEG Out) as standards. 4-Channel Audio Editing The DSR-2000A is capable of 4-Channel independent audio editing.